The Hagia Sophia in Istanbul is overwhelmingly grand, which I expected. What I didn’t expect were the cats. The cats of Istanbul are apparently unimpressed by this famous Byzantine church-turned mosque-turned museum, and they’re just hanging out or snoozing just as nonchalantly as can be. Actually all of Istanbul was full of stray cats and dogs. Well, they seemed something in between strays and pets–like they weren’t owned by anyone in particular but they we’re friendly and people were feeding them. One day we were walking in the Fatih district of Istanbul when we saw a woman with a cart full of fish followed by an entourage of cats. She was yelling out a sales pitch, and residents would emerge from their apartments to buy fish. The woman would then gut the fish for the buyer, throw the guts on the ground, and continue on while the cats gobbled the entrails. Efficient! Another day we went on a self-guided walking tour, and two dogs stayed with us all day, as if they were our temporary rent-a-pets. 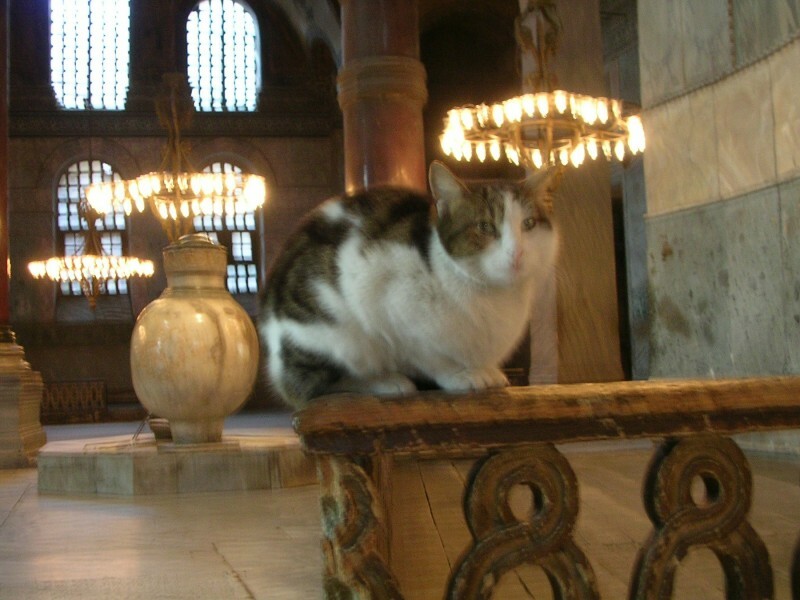 So anyway we were using our guidebook to tour the the Hagia Sophia, but I kept being distracted by cute kitties. After sharing a quality pet-and-purr session with a particularly handsome specimen, I turned around and HOB was posing for pictures with fifty uniformed school girls. (After several days of HOB being treated like a celebrity by the residents of Istanbul, we asked our hotel manager what was going on. He said HOB has a strong resemblance to an actor starring in a series of bank commercials, and he showed us one of the commercials on YouTube.) In between the distractions of the cats and HOB’s celebrity status, I had a hard time concentrating on the building itself. For a building made in 537, it’s incredibly impressive. But maybe that’s was the problem: sometimes grand buildings seem to be bragging “Look at me, look how huge and shiny and breathtaking I am” and I can’t focus on it’s artistic merits and lose interest. What actually knocked my socks off was not the building but it’s mosaics. Holy cats, the mosaics are outstanding! The Deesis mosaic, depicting an icon-like Christ with Mary and St. John, is finely detailed, extraordinarily well-crafted and much more sophisticated in it’s coloring and figuration than most art made in the 13th century. Istanbul is a city of spectacular art, great food and friendly people. Sultanahmet, the old-city district, is a UNESCO protected area, and full of must see sights, and unfortunately, some of the most aggressive salespeople I’ve ever encountered. Not gonna lie: it was really irritating being hustled all the time–anytime we pulled out a map, stopped to take in a view, or even just walked in the general area of a shop. So if you ever find yourself in Sultanahmet, and the relentless hustlers are getting you down, reach down and pet a friendly dog or cat. At least someone there wants nothing more from you than a scratch behind the ears. In between posing with Turkish schoolgirls, the famous HOB has a moment to snap this selfie with me. The Hagia Sophia was an Eastern Orthodox cathedral from 537 until 1453, when it was converted to a mosque and the minarets were added. 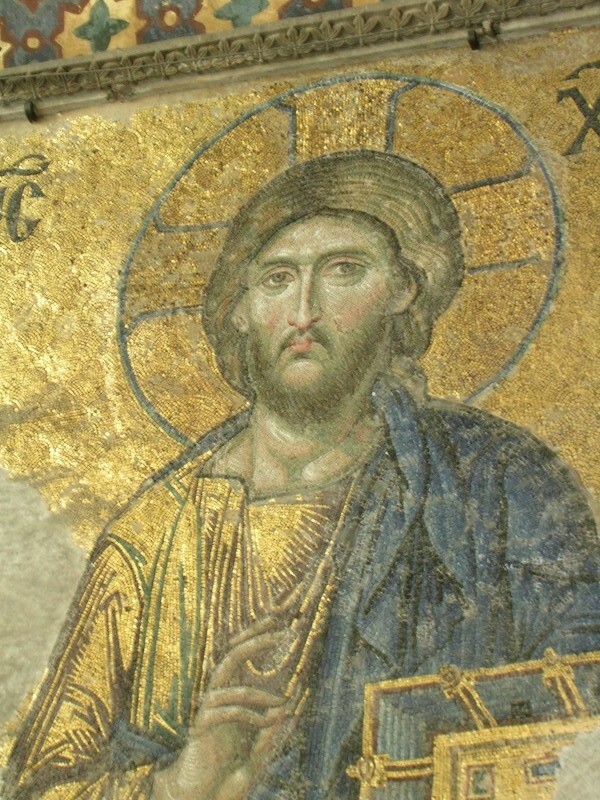 Detail of the Deesis mosaic, which is so much more beautiful in person than any reproduction can convey. Doesn’t he look a Duccio Christ with a hangover and a wig? The Hagia Sophia is amazing.